FORGET Lack shelves or Malm beds - when it comes to Ikea, Australians yearn for some very particular products. The retail giant has said that a peculiar quirk of Australian homes has led consumers to hunt for different furniture here to shoppers overseas. While our homes are shrinking, our living rooms are ever-expanding. And that's meant a new kind of sofa - which is also a bed and even a cupboard - is all the rage in Australia. Ikea call this type of piece, "flexible furniture". The Swedish icon has also revealed to news.com.au which humble item is the number one best-selling product in Australia. And the company's Australia head has confided what his single favourite item is. 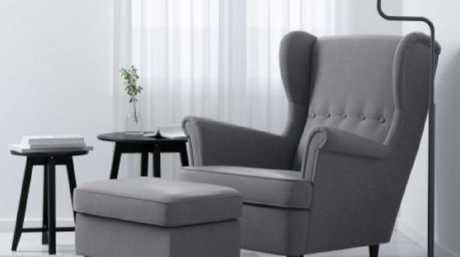 Ikea Australia interior design leader Christine Gough told news.com.au that the company was constantly reacting to the changing ways we use our homes. "The world is changing, life is changing and the home is changing. Urbanisation and technology have changed our lives and the way we live at home, especially in the living room." One room was a particularly interesting space, she said. "The living room is paradoxical - it is open but also personal, quiet and reflective. "For this reason, the living room needs to be both comfortable and functional, to fulfil many individual needs and as a result we are seeing 'multifunctional' furniture become increasingly popular." 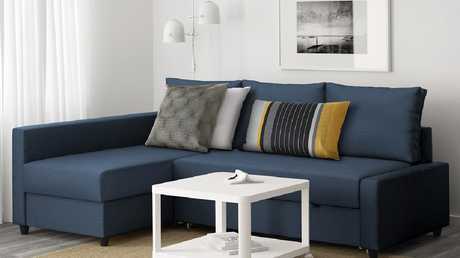 Ms Gough said the company's Friheten sofa was now one of the biggest selling items by value in the country, which she put down to both its various uses as well as the unique shape of Australian homes. "From our research and home visits, we know that the average home is shrinking in size and that for many people making every square metre of a space useful and multifunctional is a really important element for a happy everyday life at home. "In Australia while our spaces are becoming smaller, we tend to have larger living rooms and homes than many other countries," she said. 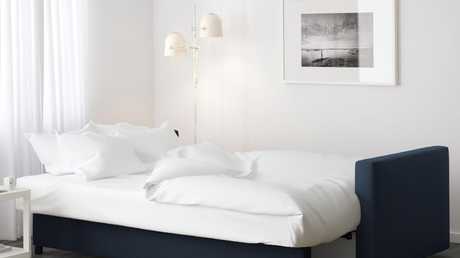 At almost 2.5m long, Friheten is a sofa, chaise lounge and double bed in one, the bed sliding away when not in use. "Friheten is one of our highest selling modular sofas and comes off the back of year on year modular sofa growth, as Australians discover the benefits of flexible furniture. 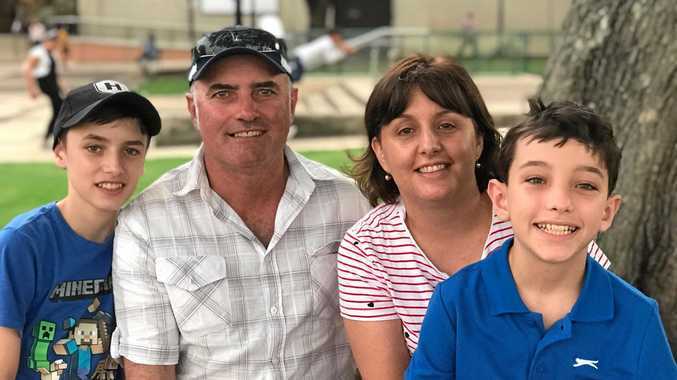 "You can be together or apart but still in the same room and you can use one piece of furniture to solve many needs when it comes to the way you live at home; an extra bed, storage or flexible seating." Ikea recently made the bold prediction that the kitchen would eventually disappear completely, to be replaced by communal cooking facilities in apartment blocks where we live cheek by jowl with our neighbours. Not that Australians are completely out of step with Ikea shoppers elsewhere. When it comes to furniture, the top-selling item here is the same as in much of the world. Ikea Australia country manager Jan Gardberg said the "good old Billy bookcase is still going strong". First launched in 1979, it's estimated that a Billy bookcase is sold somewhere in the world every five seconds - in Australia, Ikea sells 120,000 a year. 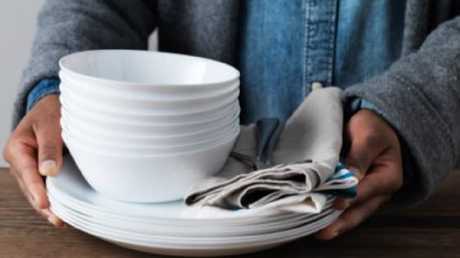 Oftast plates and bowls, the best-selling item in Australia. When it comes to sales, however, it's something far smaller than a bookcase, sofa or bed - it's a plain white plate. At 69 cents a pop, Ikea sells 1.4 million Oftast dining plates in Australia each year. "It's actually kind of a bowl - it has a fantastic price and design," Mr Gardberg said. "It's more from a volume perspective because we are always interested in volume, the more people we can reach the better." Ikea Australia country manager Jan Gardberg’s favourite product is the Strandmoon chair. But Mr Gardberg said his personal favourite item was the Strandmoon wing chair - originally introduced in the 1950s and revived 60 years later. "It still has the classic [look] to it so it kind of reminds me a bit of the past, but it exists in green and yellow then it's a bit more forward-thinking," he said. "I have this at home. It is actually one of our big sellers." As part of the Swedish furniture giant's 75-year birthday celebrations, Ikea will be bringing back some of its most popular products from the '60s, '70s, '80s and '90s as "limited collections". "The reason why we exist is only because of the range. As long as we have a range people have an opinion about, that's what we live for," Mr Gardberg said. "This is to celebrate [the ranges] that brought people to Ikea over the 75 years. You will recognise, this is really '60s, '70s. Jeans was really big back then, that was at the forefront. 'How can you be so crazy to put a jeans cover on a sofa? That's spaced out.'" … now it’s a double bed.